Go Mi Nyu is a sister-in-training. When her twin brother Go Mi Nam successfully auditions into the musical band A.N.JELL but is forced to leave for the United States to correct a botched plastic surgery effort, she is approached by his manager to pose as Mi Nam for the duration of his recovery. Against her wishes, Mi Nyu accepts in order to fulfill her brother’s dream of finding their mother. 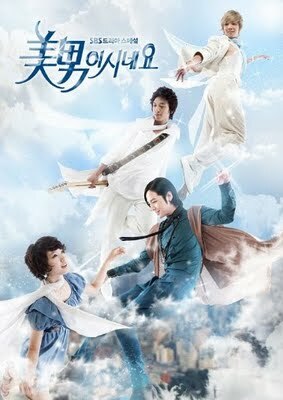 Now, posing as Mi Nam, Mi Nyu enters the group A.N.JELL and meets its members; Hwang Tae Kyung, Kang Shin Woo and Jeremy. Initially disliked by Tae Kyung, the group’s leader and composer, Mi Nyu slowly falls in love with him, only to find herself entangled in a love triangle between him and Shin Woo. Jeremy also harbors a one-sided love for her despite not knowing she’s a girl. As a result, all three members of A.N.JELL fall in love with Mi Nyu. Additionally, Mi Nyu finds herself rivaled against Yoo He Yi, an actress who also has feelings for Tae Kyung. Now Mi Nyu has to wait in the “Mi Nam disguise” until he comes back from US, but its not easy due the media and paparazzi. Will she be able to hide her identity? Will she be able to keep up with this little secret that she is not a guy until the real Go Mi Nam comes back..? Jang Geun Suk and Park Shin Hye were both cast first in their roles due to their acting skills. Director Hong Sung Chang stated that the two, Jang being 20 and Park 19 respectively, are well-suited to convey “fresh” idol stars. Lee Hongki, who was a child actor, has made his acting comeback after a break of 5 years (his last being Kkangsoon” in 2005) by being cast as Jeremy.An SBS spokesperson stated that because Hong Ki is actually a part of an idol group FT Island , the “role will suit him very well.”The role of Shin-woo marks Jung Yong Hwa’s acting debut, which he auditioned for whilst preparing to debut with his band C.N.Blue in Japan.